Before diving into all of the great benefits of topdressing golf greens, it is important to clearly convey what exactly this procedure entails. Light and frequent topdressing involves spreading a thin even layer of fine sand over the playing surface and then either dragging it in with a brush or watering it in with overhead irrigation sprinklers. A common misconception on the golf course is that any topdressing procedure is associated with “aeration”. Aeration is a completely separate procedure that does normally involve an application of sand to fill aeration holes, but at a much heavier rate. 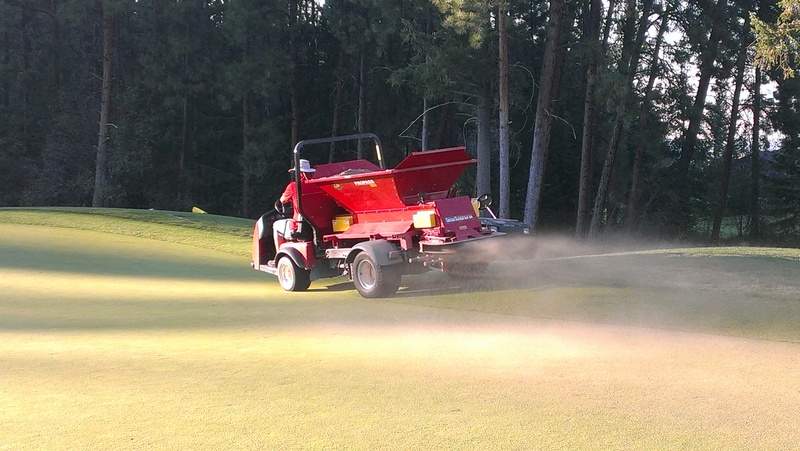 Light and frequent topdressing does not involve any disruption to the surface except a light even application of sand. Depending on the rate used, it takes anywhere from about 8 to 20 cubic yards of sand to complete all greens on one golf course. The sand has to be transported with a large carrier around the golf course which will then supply a smaller machine that actually does the spreading. This will be followed with a cart dragging a brush behind it, and then 5 to 10 minutes of irrigation water. The sand that we use at the Okanagan Golf Club comes all the way from Salmon Arm, BC at a very big expense. Not only is the trucking expensive, but also is the material because of the strict specifications it must adhere to. The sand must have specific ranges of particle sizes which is of utmost importance. The composition of the sand is what has the largest affect on playing conditions of the golf green. The main point I am trying to make with all of this pre-amble is that there is a tremendous amount of planning, organization, labour, equipment use, and ultimately a great expense involved with a topdress application. So one should wonder… if it takes that much effort and expense to do a topdress procedure, why would we want to do it as often as we can. This leads to my next point… topdressing is one of the single most important procedures we can do to improve playing conditions, but also improve long term turfgrass health. 1) Smoothing the putting surface – When a light application of sand is applied and dragged with a brush, it essentially fills low spots on the surface. Commonly the low areas are ball marks, cleat marks, mower wear, or possibly wildlife tracks. When the brush drags over the surface, it will carry sand with it and then drop it into these low areas, making it ultimately much smoother overall. To completely fill these low spots with one application would require a much heavier rate then we typically do. However, the cumulative effect of multiple applications of sand will have the same effect. 2) Reducing/diluting thatch buildup – With greens type turf such as Annual Bluegrass (Poa annua) or Creeping bentgrass (Agrostis stolonifera), they produce a tremendous amount thatch because of their growth habits. Greens type turf requires that they “spread” aggressively by horizontal stems (stolons) that grow right on the soil surface. Thatch is essentially the dead plant material from the turf stolons that are no longer a functional part of the plant but not yet into the decomposition stage. This is most commonly caused from stolons but could also include dead leaves, stems, or roots. These parts of the turfgrass plant are composed of very complex carbohydrates (i.e. cellulose) that are not easily decomposed or broken down by microbes. Since they are not readily broken down and recycled into nutrients, we have to physically deal with it to prevent our greens from becoming really spongy and soft. This is usually the main reason for core aeration – to remove thatch and replace with sand to help it from building up over time. Although a core aeration has a much more drastic effect on reducing thatch, regular topdressing can also achieve great thatch reduction. By adding a light layer of sand to the greens every couple of weeks, we are essentially adding mineral material at the same rate as the organic material (thatch) is building up. As long as we keep the organic and mineral materials somewhat even, we will never reach a level of thatch that will be problematic. A defined layer will still be formed at the soil surface, but it will be a good mixture of sand/thatch which we refer to as “mat”. This is a very positive thing as it gives s the greens surface resiliency to traffic, ball marks, and mower wear. There is no way to eliminate core aeration completely, but definitely the more regular topdressing we do, the less core aeration we will need to do! 3) Firming the surface – This is achieved mostly by diluting thatch, and preventing too much buildup of spongy organic material. As mentioned before, the sand we use for topdressing is composed of certain sized particles to display certain physical properties that we want. It has enough coarse particles to allow for good air and water movement, but also has some finer particles to allow for some compaction. Compaction is not usually considered a positive thing when dealing with turfgrass growth, but in the case of a golf green it is. Greens need to be compacted so that they are firm as possible, but this is okay since sand still has plenty of room for air and water movement even at its maximum compaction. The bottom line with topdressing is that the more sand that is applied to the surface, the firmer it will be overtime. 4) Improved Plant health – All of the aforementioned benefits of topdressing ultimately add up to the most important thing – long term improved plant health. There are direct relationships from these benefits to plant health. For example, by smoothing the surface, the quality of cut from the greens mowers is drastically improved. If the surface is uneven, mowers will “scalp” turf in the high areas, and leave long leaf blades in the low areas. By getting a nice even cut every day, the turf will be much healthier for it. By reducing thatch, there are a myriad of benefits such as improved water percolation, better air exchange, improved quality of cut, and lower water usage, which all greatly affect plant health. Keeping the surface firm will also improve quality of cut, reduce wear on the turf, and reduce the effect of ball marks. The main goal for this blog entry is to help communicate the very important reasons for why we must topdress greens on a regular schedule. If you have been golfing for very long, you most likely have seen topdressing occur on a regular basis and maybe think nothing of it. However it is not uncommon to come across someone who does not understand the procedure and they think we do it simply to try and ruin their golf game! It is very important to understand that every procedure we do (even core aeration) is done for very specific and concise reasons that will ultimately have a positive effect on the conditions of the course. We would not do it if did not need to be done for your enjoyment of the game. There is a lot of technical information in this entry so please feel free to comment with any questions and I will get back to you as soon as possible. Cheers and happy golfing!